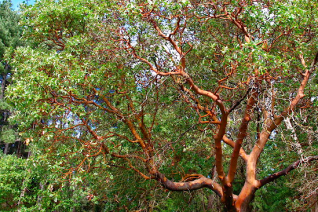 Pacific Madrone, iconic tree of the Pacific Northwest. Famous for its glossy, russet orange, sinuous, exfoliating bark and round, evergreen foliage. In spring, clusters of white flowers are showy and turn into vivid red berries by autumn. These are loved by birds- especially western tanagers who will quickly strip a tree as flocks move from one to the next. Must be grown from seed and it must be transplanted when small. Just the way it is. Plant it in average, well drained soil. Water lightly through the first summer in subsequent years leave it strictly alone. Full sun is best- tends to wander towards the sun in shade. Underplant with low water natives such as Arctostaphylos, Ceanothus, Vancouveria. Slow at first it picks up speed after about 4 years- then it can grow 2′-4′ a year. Somewhat messy tree- loses leaves in summer and the bark exfoliates all over the place too. Know this and live with it. Ours are raised from seed of trees native to our wholesale nursery site- so its a local strain. Oregon native plant. 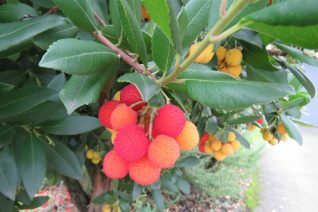 This is the standard small tree form of Strawberry Tree that is so important in PNW horticulture. A good looking evergreen tree that eventually forms a rounded dense crown. To 16′ tall and a third as wide in 10 years. Excellent small patio tree- as long as you account for the prodigious autumn fruit drop. Birds and squirrels consume the fruit which is alluded to in the specific name unedo- which means ‘I eat only one.’ I know people who eat them and claim to like them. So to each their own. No denying the electric neon yellow to bright red fruit is striking September to December. White urn shaped flowers appear simultaneously with the fruits in autumn. In time the bark develops to dark brown and shredding. Native to the Mediterranean with a disjunct population in southern Ireland. Drought tolerant when established. 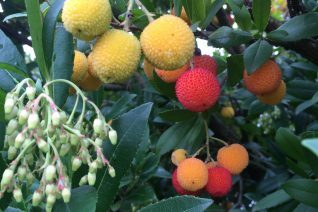 Compact, everblooming form of Strawberry Tree with a huge attendant crop of vivid fruit in autumn. To 9′ tall and 8′ wide in 10 years in any well drained soil with light summer irrigation- completely drought adapted when established. Good looking, climate adapted evergreen native to the Mediterranean as well as Ireland. Nice specimen or small garden tree. Avoid the coldest, windiest sites. Handsome shredded mid-brown/red bark. Provide good air circulation.